Mexican dance ADELITA BOOTS FOR KIDS ,with nails for folkloric regional dance .have a gripping sole and nails on the heel and tip. 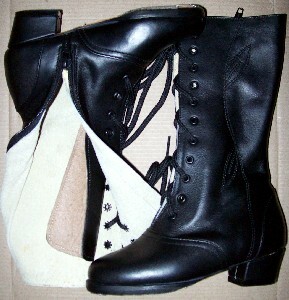 BOOTS comes with lace up and zipper for faster access. model of the boots may vary (when you buy please let me know LARGE OF THE FOOT IN INCHES) we have all sizes and WHITE color too.